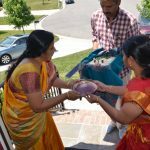 The couple Ms. Ranjani Rajasekhar and Sri Rajasekhar are devoted to Sri Guru Maharaj’s Kainkaryam and live in the North Carolina area. 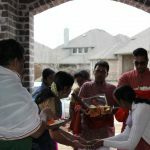 Their prayer to Sri Swamiji was that their new house be consecrated by the divine presence of Sri Swamiji’s Holy Padukas, and that would be their house-warming ceremony. Accordingly, a grand Paduka Pravesham and Pattabhishekam was performed on the morning of April 22nd 2013 at their the new residence of in Morrisville, NC. A specially decorated simhasana (chair) was readied on which Sri Guru Padukas were seated. 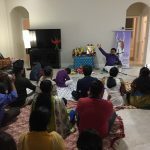 The satsang started with Prabhodanam and the host couple then performed Paduka Puja welcoming the Divine Padukas into their new home. Venu Geetham, Gopika Geetham from Srimad Bhagavatam and Padhuka Pattabhisheka Adhyayam from Valmiki Ramayanam was then recited. 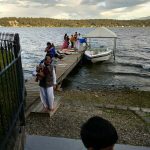 As the new home was christened ‘Brindavanam’, Lord Krishna’s arrival into Brindavanam and His ‘Murali Geetham’ was celebrated with Sri Swamiji’s Kirtans. 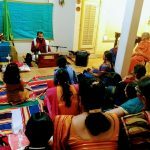 Sri Narayananji from Boston delivered a beautiful lecture on the importance of Guru Paduka by quoting examples from Srimad Bhagavatham and Ramayana. In a lighter vein he told that this was the first time that Paduka Pattabhishekam was happening in “ Brindavanam”. Bhagavatam says Uddhava did Shri Krishna’s Padhuka Pattabhishekam at Badrikashram, a place very much apt for yoga and dhyana.But in Kali Yuga, Nama sankirtanam is the easiest way and that was verily the reason, Sri Swamiji has blessed a Padhuka Pattabhishekam in “Brindhavanam”. 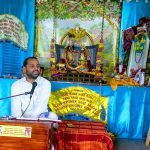 Following this, amidst a royal umberlla being held over the Padukas and swaying of the ‘chaamaram’, showering of flowers and singing of Sri Swamiji’s Paduka Kirtans, Paduka Pattabhishekam was celebrated in a grand manner. In the evening hours, Anjaneya Utsavam was celebrated by reciting Hanuman Chalisa and Madhura Geetam on Lord Anjaneya. Local devotees as well as devotees from Virginia participated in the event.